Reducing water use is a great way to save money on water and energy. The plumbing in your home, as well as the appliances, can have a huge impact on the amount of water you use each month. Using less water also means using less energy. Reducing water and energy consumption not only helps the environment, but also saves money on your monthly bills. Southland Custom Homes understands the importance of conserving water. Our Georgia premier new home builders are dedicated to providing our clients high quality, customizable homes that are comfortable and efficient. Low flow toilets are a great way to reduce water use. Standard toilets use between three and seven gallons of water per flush. Thanks to new water saving modifications, ultra-low flow toilets now use less than one and a half gallons of water per flush. 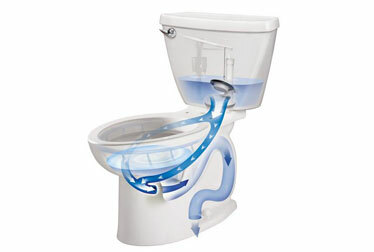 It is estimated that one family of four using ultra-low flow toilets could save around 22,000 gallons of water a year. That kind of reduction could save up to $200 a year on water and reduce their environmental impact at the same time. These toilets have undergone extensive performance testing to ensure that you will not sacrifice quality for efficiency. Southland Custom Homes uses Delta Windemere faucets to build the most efficient kitchens and bathrooms in each home. Installing low flow faucets and shower heads can reduce water use in a home up to 30%. Delta is committed to green manufacturing processes and producing long lasting, high quality products. Each Delta product is designed for maximum efficiency without losing any of the convenience and comfort that you have come to expect. Delta's latest faucet advance is their DIAMOND Seal Technology. The new design guarantees that your faucet will be leak and drip free. Our new home builders know the benefit of using the best products to add the final touches to your custom home. Hot water is essential for many everyday activities such as showering, laundry and washing dishes. Water heating is usually the second largest source of home energy use, next to heating and cooling. An efficient water heater can save money and energy while still providing the comfort of hot water throughout the home. Southland Custom Homes uses Rheem hi-efficiency electric water heaters to ensure the most efficient use of energy. Rheem is Energy Star certified, meaning these products are guaranteed to save money, energy and protect the environment.